VIDEO: Indianapolis Motor Speedway is big. Like REALLY big. INDIANAPOLIS -- Yes, we know Indianapolis Motor Speedway is big, but how big? You may have seen a photo showing everything that can fit inside of it, like Vatican City, Yankee Stadium and The White House. 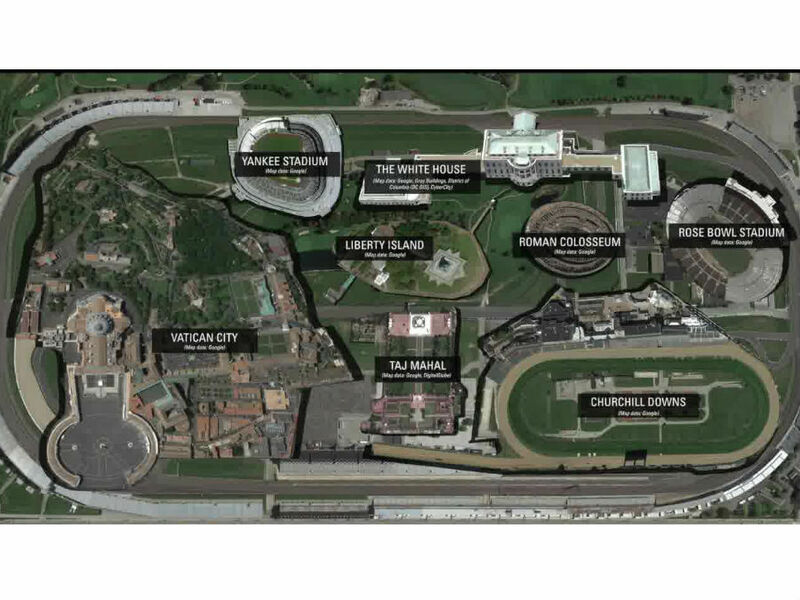 But a recent video produced by ESPN may give you an even better idea of the size of IMS. The video shows a 3-D lap around IMS, following IndyCars around the track. The cars pass Britain's House of Parliament, the Eiffel Tower and Vatican City in Turn 1, then pass The White House and Russia's Winter Palace in Turn 2. In the back straightaway, the cars pass three aircraft carriers. In Turn 3, the cars pass the Roman Colosseum and the Taj Mahal. Lastly, the cars pass Yankee Stadium, Sydney Opera House and Wembley Stadium. All that, plus the Egyptian pyramids would fit inside IMS. Click here to watch the video of the 3-D track.